There are usually classified by the main ingredient, how it is pickled, and how long it is pickled. There are also many ways of pickling such as with vinegar, salt, soy sauce, koji, sake kasu (sake lees, the leftovers from sake production), miso, or nuka (rice bran). They can be pickled and ready to eat in 30 minutes (asazuke) or pickled for much longer (furuzuke). You might already know some of the most common tsukemono in Japanese cuisine. Sushi ginger that is on every plate of sushi and sashimi plate that you order. Fukujinzuke or Rakkyo on Japanese Curry. Kizami Beni Shoga in Okonomiyaki and Takoyaki. Takuan, Yamagobozuke, Kyurizuke, and Shibazuke in sushi rolls. Or the very well-known umeboshi onigiri (rice ball). Also called Sushi Shoga or Gari. It is the perfect complement to Sushi and Sashimi. Eaten between bites of sushi to clean your palate for the next bite. Only this way can you truly enjoy the quality of taste of the fish. Sushi Ginger is also antibacterial, which helps prevent food poisoning in case the sushi or sashimi is of lower quality. Sushi Ginger is made with young ginger roots which are less fiberous, compared to the easily distinguishable much older and fibrous ginger roots you can find at your local grocery store. ****We have sushi ginger in many different sizes such as 20lbs buckets for restaurants or if that is too much, we also have 1kg (2.2lbs) bags, 1gal bottles, 14oz bottles, 8oz cups, and 4oz bags. 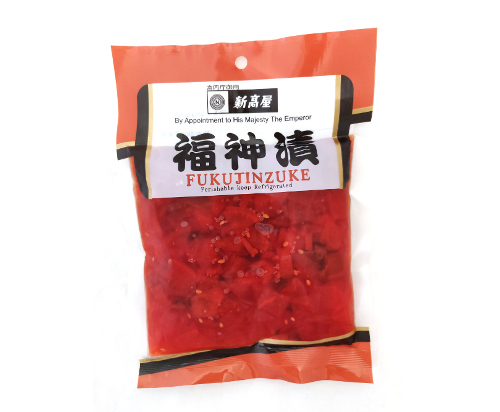 Furuzuke is not limited by ingredients or pickling medium and is classfiied by how long the pickling process is which is usually from a few days to months, compared to the much shorter Asazuke. Fukujinzuke, commonly eaten with Japanese curry, is usually made of finely chopped daikon, eggplant, lotus root, and cucumber pickled in a soy sauce base. Shibazuke is bright purple made of cucumber, eggplant, and aka shiso (red perilla leaves) pickled in umezu (Japanese plum vinegar). Kyurizuke as the name implies is cucumber pickled in a soy sauce and vinegar base. Rakkyo is made of Japanese Shallot (or some people call it Chinese scallion bulbs) pickled in rice vinegar. It's refreshing taste and crunchy texture goes great with Japanese curry. Furuzuke is not just limited to the above. ****Niitakaya has these tsukemono in 2kg (4.4lbs) bags, 1kg (2.2) bags, 500g (1.1lbs) bags, 4oz bags, 14oz and 9oz bottles, 8 oz cups, and many other sizes. Fresh Vegetables are prepared and lightly pickled with vinegar, sugar, and water in as little as 30 minutes. The short pickling time allows the vegetable to retain its texture and refreshing taste. 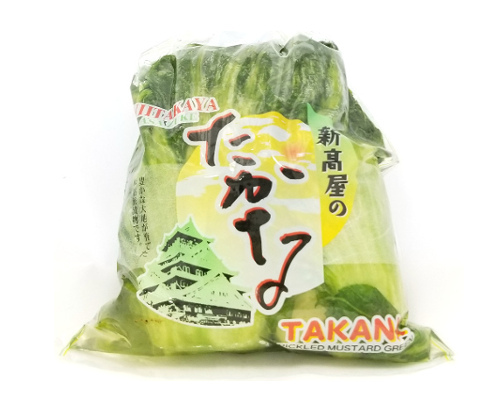 Commonly vegetables for asazuke are daikon, eggplant, cucumber, carrots, kabu (turnip), nappa cabbage, and takana. Niitakaya has both 2.5lbs bulk sizes and 10oz bags. It's usually served alongside other types of tsukemono in a traditional Japanese meal but also enjoyed after a meal because it is thought to aid digestion. The traditional method of making Takuan is sundrying until it is dehydrated but varieties made without dehyrdating or even smoked are available. Each has it's own texture and flavors. Takuan can come in many different ways. Ippon (whole daikon), half, sliced, strips, and chopped. 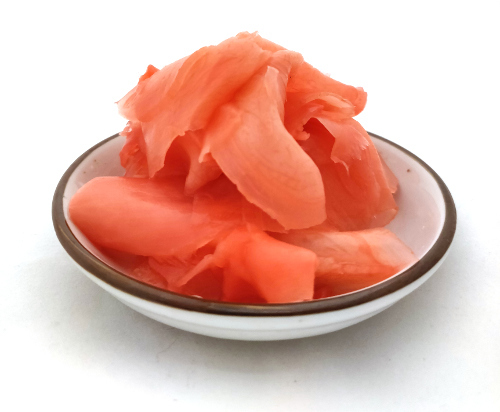 Umeboshi (pickled plum) is one of the most popular tsukemono in Japan. They are extremely sour and salty but there are also varieties sweetened with honey, making it more favorable for people with sweeter tastebuds. You can often see them in bentos or onigiris (rice balls). They are usually naturally colored using red perilla leaves. Harvested in June, the plums are then packed in barrels with salt with a weight placed on top. This extracts juices that are then marketed as umezu (plum vinegar) which is then used for other pickled products. It is believed to have many health benefits such as digestive aid and nausea prevention. Its sourness and saltiness can also help with fatigue. 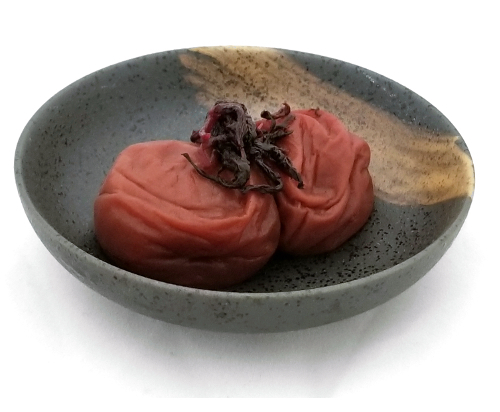 Umeboshi is great for bentos, onigiris, or as is as a side dish. Check out our selection! Popular in Tokyo, Bettarazuke is a specialty and foundation of Niitakaya. It's daikon pickled in sugar, salt, and koji. Its name comes from the stickiness from the koji that is leftover because it isn't filter out. Check out our Bettarazuke straight from Tokyo! Nukazuke is fermentation by rice bran, the outer layer of the grain (nuka). The nuka bed is usually kept in wooden crocks, faithfully stirring by hand every day and the nuka beds would reused and kept indefinitely. Many varieties of vegetables and some fish are usually used such as cucumber, carrots, daikon, sardines, Japanese horse mackerel, and many more. Check out our Nukazuke straight from Tokyo!